London's theatreland in the West End has apparently been packing them in for 350 years. Cynics might assume that The Moustetrap and Les Miserables were the big openings back in 1663, but luvvies are preparing for a celebration. After all, there's nothing British theatre enjoys as much as celebrating its own fabulousness. West End Live, an annual celebration of the capital's stage shows, is now in its ninth year, but this June it will be making an extra effort to grab the public's attention. 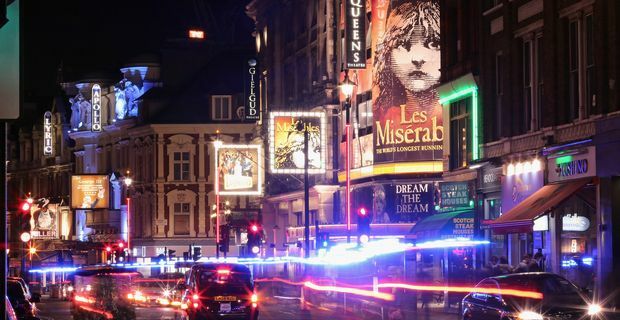 Performers from hit shows Les Mis and Jersey Boys will be offering free samples to the public in Trafalgar Square on June 22 and 23, alongside cast members from Billy Elliot The Musical, Disney's The Lion King, Mamma Mia!, and Matilda The Musical. There will also be a preview of From Here To Eternity, the latest show from West End legend Sir Tim Rice. From Here To Eternity follows the safe West End formula of adapting a familiar story, in this case the old movie that will be remembered by the coach parties of pensioners who keep the box offices ticking over outside of tourist season. Nobody ever went broke underestimating the taste of the average West End theatre-goer. Oh, wait, that's not true. The backers of the Spice Girls jukebox musical, the ironically-titled Viva Forever! are currently counting their losses. Just as theatreland celebrates its longevity, the production will be packing away its Union Jack mini-dresses and Scary Spice wigs. Producer Judy Craymer admitted that they just could not make the show, written by Jennifer Saunders, work. "Viva Forever! may be taking its leave for now in the West End, but the legacy of Spice Girls will never fade," she said, optimistically. Theatreland doesn't dwell on failure though. How about a soundbite from mayor Boris Johnson? "London Theatreland is unbeatable and this is a fabulous way to sample some of the most exciting shows to be seen anywhere in the world." Thanks Boris, you were fabulous, love.